Protect Your Content: When it comes to making money on the Internet, content will always be king. You don't necessarily monetize the content directly, but it's a great tool to lure in vistors to expose them to targeted advertising. Here's how it works - you buy or write quality content, it gets spidered by the search engines, and then targeted traffic comes to your site. Remember Your Logins: According to the AffStat 2004 Report, 40% of affiliates actively promote 51 or more affiliate programs. That means a whole lot of affiliates are juggling a whole lot of affiliate logins. 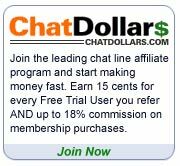 Personally, I'm actively promoting affiliate programs through Affiliate Fuel, ClickBank, Commission Junction, CPA Empire, Kolimbo, LinkShare, MaxBounty, Performics, Primary Ads, Shareasale, plus a bunch of independent programs with their own logins. Site Templates: Your site design could be holding you back from making bigger money as an affiliate. I've seen some really bad sites for big companies, and some amazing sites from individuals. If your site gives the impression of an established company, you've got a better chance to close an affiliate sale. Build Your Opt-in List: One of the most effective ways to build traffic to your site is to collect opt-ins for an email newsletter. There are two important components to a successful email newsletter: compelling content and a continually growing opt-in list. The more folks that opt-in to receive your newsletter, the greater chance you'll have to drive targeted traffic to your site or directly through affiliate links in your email newsletter. Sub ID Tracking: Many affiliates have more than one site (or newsletter), and they would like to track their affiliate links from these multiple sources. Also, affiliates that provide rewards or incentives to members need to distinguish which person referred a given action. Bravenet Tools: It's a tough job creating a Web site that is going to make your visitors want to come back. It's not easy and it's not cheap to build in features like message boards, e-mail forms, mailing lists and vote casters. Buy Domain Typos: You spend a lot of time driving traffic to your site, but due to human error, some of that traffic is not making it to your site. One of the reasons for this is that people are making typos when they key your domain into their browser. According to Google, 10% of all of their search engine queries contain misspellings. I know I often make a mistake when my fingers blaze across the keyboard a bit too fast. Test Your Links: It may seem like a very basic suggestion, but you would be surprised how many people upload affiliate code that is accidentally corrupted. Case in point - one of my top ten 'super affiliates' was recently running bad links. It's essential for you to test, because you deserve to be paid for every referral you make to affiliate programs. And the tracking is erased when the links are corrupt. Geo-Target Your Visitors: Since we're working on the World Wide Web, it stands to reason that we should be targeting different regions with appropriate offers. For instance, if a person from Boston hits your sports memorabilia site, it would likely be most effective to push Red Sox and Patriots goods on them. But when somebody hits your site from Liverpool, England, they are more likely to buy goods for the Everton Football Club than for teams from the New England area.